Below is a blog post from Tim Shanahan, Distinguished Professor Emeritus of urban education at the University of Illinois at Chicago. He was Founding Director of the Center for Literacy and chair of the Department of Curriculum and Instruction. Tim’s information is timely and important as we launch our school year and communicate our expectations to parents in supporting their kids’ reading. Parents often ask how they can help their children learn to read; and it’s no wonder that they’re interested in this essential skill. Reading plays an important role in later school success. One study even demonstrates that how well 7-year-olds read predicts their income 35 years later! This article provides 11 practical recommendations for helping preschoolers and school-age students learn to read. 1. Teaching reading will only help. Sometimes, parents are told early teaching is harmful, but it isn’t true. You simply can’t introduce literacy too early. I started reading to my own children on the days they were each born! The “dangers of early teaching” has been a topic of study for more than 100 years, and no one has ever found any convincing evidence of harm. Moreover, there are hundreds of studies showing the benefits of reading to your children when they are young. You don’t need a Ph.D. to raise a happy, healthy, smart child. Parents have been doing it for thousands of years. Mothers and fathers successfully teach their kids to eat with a spoon, use a potty, keep their fingers out of their noses, and say “please.” These things can be taught pleasantly, or they can be made into a painful chore. Being unpleasant (e.g. yelling, punishing, pressuring) doesn’t work, and it can be frustrating for everyone. This notion applies to teaching literacy, too. If you show your 18-month-old a book and she shows no interest, then put it away and come back to it later. If your child tries to write her name and ends up with a backwards “D,” no problem. No pressure. No hassle. You should enjoy the journey, and so should your child. 3. Talk to your kids (a lot). Last year, I spent lots of time with our brand new granddaughter, Emily. I drowned her in language. Although “just a baby,” I talked — and sang — to her about everything. I talked about her eyes, nose, ears, mouth, and fingers. I told her all about her family — her mom, dad, and older brother. I talked to her about whatever she did (yawning, sleeping, eating, burping). I talked to her so much that her parents thought I was nuts; she couldn’t possibly understand me yet. But reading is a language activity, and if you want to learn language, you’d better hear it, and eventually, speak it. Too many moms and dads feel a bit dopey talking to a baby or young child, but studies have shown that exposing your child to a variety of words helps in her development of literacy skills. 4. Read to your kids. I know everyone says this, but it really is a good idea — at least with preschoolers. One of my colleagues refers to this advice as the “chicken soup” of reading education. We prescribe it for everything. (Does it help? It couldn’t hurt.) If a parent or caregiver can’t read or can’t read English, there are alternatives, such as using audiobooks; but for those who can, reading a book or story to a child is a great, easy way to advance literacy skills. Research shows benefits for kids as young as 9-months-old, and it could be effective even earlier than that. Reading to kids exposes them to richer vocabulary than they usually hear from the adults who speak to them, and can have positive impacts on their language, intelligence, and later literacy achievement. What should you read to them? There are so many wonderful children’s books. Visit your local library, and you can get an armful of adventure. You can find recommendations from kids at the Children’s Book Council website or at the International Literacy Association Children’s Choices site, as well as free books online at other websites like Search Lit or Unite for Literacy. Young children don’t hear the sounds within words. Thus, they hear “dog,” but not the “duh”-“aw”- “guh.” To become readers, they have to learn to hear these sounds (or phonemes). Play language games with your child. For instance, say a word, perhaps her name, and then change it by one phoneme: Jen-Pen, Jen-Hen, Jen-Men. Or, just break a word apart: chair… ch-ch-ch-air. Follow this link to learn more about language development milestones in children. 7. Teach phonics (letter names and their sounds). You can’t sound out words or write them without knowing the letter sounds. Most kindergartens teach the letters, and parents can teach them, too. I just checked a toy store website and found 282 products based on letter names and another 88 on letter sounds, including ABC books, charts, cards, blocks, magnet letters, floor mats, puzzles, lampshades, bed sheets, and programs for tablets and computers. You don’t need all of that (a pencil and paper are sufficient), but there is lots of support out there for parents to help kids learn these skills. Keep the lessons brief and fun, no more than 5–10 minutes for young’uns. Understanding the different developmental stages of reading and writing skills will help to guide your lessons and expectations. 8. Listen to your child read. When your child starts bringing books home from school, have her read to you. If it doesn’t sound good (mistakes, choppy reading), have her read it again. Or read it to her, and then have her try to read it herself. Studies show that this kind of repeated oral reading makes students better readers, even when it is done at home. Literacy involves reading and writing. Having books and magazines available for your child is a good idea, but it’s also helpful to have pencils, crayons, markers, and paper. Encourage your child to write. One way to do this is to write notes or short letters to her. It won’t be long before she is trying to write back to you. When your child reads, get her to retell the story or information. If it’s a story, ask who it was about and what happened. If it’s an informational text, have your child explain what it was about and how it worked, or what its parts were. Reading involves not just sounding out words, but thinking about and remembering ideas and events. Improving reading comprehension skills early will prepare her for subsequent success in more difficult texts. 11. Make reading a regular activity in your home. Ritchie, S.J., & Bates, T.C. (2013). Enduring links from childhood mathematics and reading achievement to adult socioeconomic status.Psychological Science, 24, 1301-1308. Karass J., & Braungart-Rieker J. (2005). Effects of shared parent-infant reading on early language acquisition. Journal of Applied Developmental Psychology, 26, 133-148. How our decisions can crowd out the reading for kids. Donalyn Miller has been an inspiration to me for years. She is the author of a column, blog and 2 books: The Book Whisperer and Reading in the Wild. She advocates for us to create an environment where kids are reading like real readers, rather than reading looking differently at school than it does at home. This is an interview with her telling how she got started. She is still teaching and inspiring kids, which inspires me as well. She has a great Twitter handle (@donalynbooks) and is involved in Title Talk (@Titletalk) with Colby Sharp. Another great resource for book titles and book discussions. If you’ve read either of her books, was there anything that changed your practice? Why the change in model? Over the past years, our job has changed greatly. When coaches were first introduced into the HSD, they were literacy coaches with the role of supporting the implementation of a new writing curriculum. As years past, and initiatives shifted, the role of the coach shifted as well. A few years ago, coaches were “re-branded” as Instructional Coaches and split into buildings, rather than grade levels. Although this change was difficult, it allowed the coach to be in a building more regularly and build relationships with the teachers in that building. Unfortunately, with implementation of the CCSS and recent district initatives, not a lot of time has been spent on understanding and shifting the role of the coach. We, like you, want to be more intentional about our practice and put our focus on improving student achievement and student success. 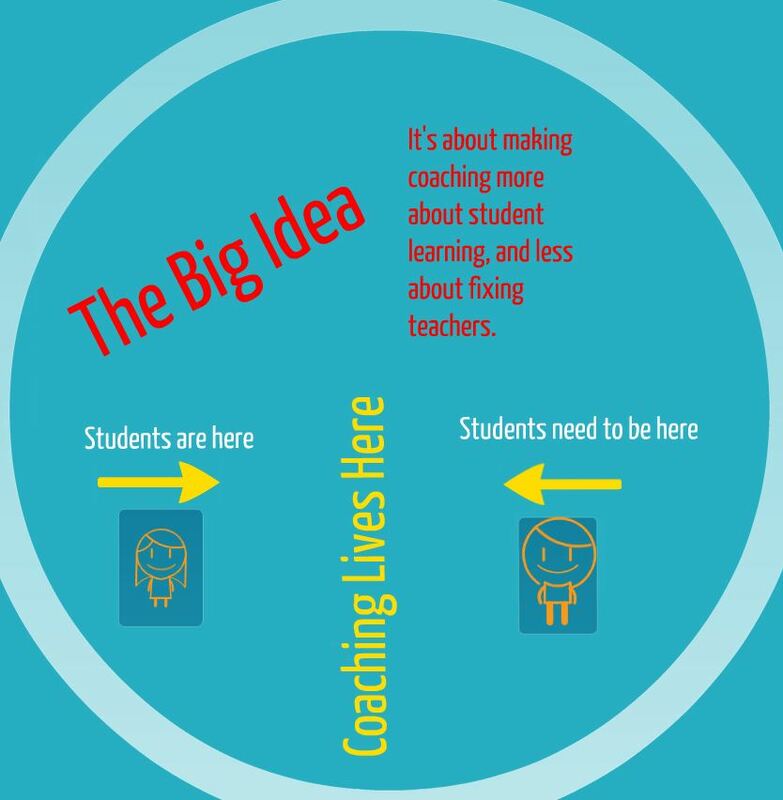 In the next couple of weeks, we’ll dig in deeper to the elements of a coaching cycle, what is the benefit to the teacher and students and how we’ll get started. In the mean time, what questions do you have about the new model? I am so excited to be back at it with children here! It has been a summer filled with learning, family and fun. But, we’re never really content until small voices fill our hallways. As we enter into a new year, I feel blessed that we have an opportunity to reflect back on our year and set some goals for a new year. We are implementing a new coaching model and I am desperately trying to refine my practice to be more effective in my role. Although my “do-over” as a coach isn’t as grand as a classroom teacher’s, we are all granted the favor of a new beginning. I am taking a class on coaching and am enrolled in another which will begin in October. We added a new coach to our team, which allows our coach team the opportunity to reflect on our practices and better understand our purpose and role. I am also anticipating refining my work with teachers based on my learning, both this summer and in the classes I am taking. What are some goals you have for yourself? What are some hopes you have for me and our work together?